Ok. I, admit, it´s of the streets. But looking for ambience, a reason to get away from the noisy traffic, to step over the line to a dreamy world you could expect to see in a movie scene at the Sundance film festival? Well, you found it. Samsara is atmosphere. It is just as perfect for a riverside drink as it is for dinner. You can enjoy the wonderfull riverside view with a coffee, a Tripel Karmeliet (Belgian beer), a glass of wine or a coctail. Or you can come for a full dinner. All options available. As a bonus, you can let your feet dangle a few centimeter above Chao Phraya river lunch time or late evening with a cocktail in you´re hand, waiting for the food to be served, or even dip them into the water. If you dear. I just love it. Bring your friends or surprise your partner. 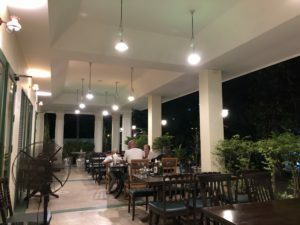 Get inside, but don’t forget to have a look at the beautiful photos on the way in to the main rom and the terrace right at the boarder of Chao Phraya river. Then you soon understand why those of us who knows Samsara continue to come here. They have 7 main tables with 4 seats on the main terrace. In addition, there is the small terrasse with 2 tables for 2 were you´re toes can reach water while you do some boat spotting or giving you’re loved one your inner secrets. Why don’t you start off with a beer, a glass of wine or a summerly mixed coctail at the terasse while you investigate the menu. Belgium beers like Duvel, Tripel Karmeliet and Kreek are available. Decent wine as well. 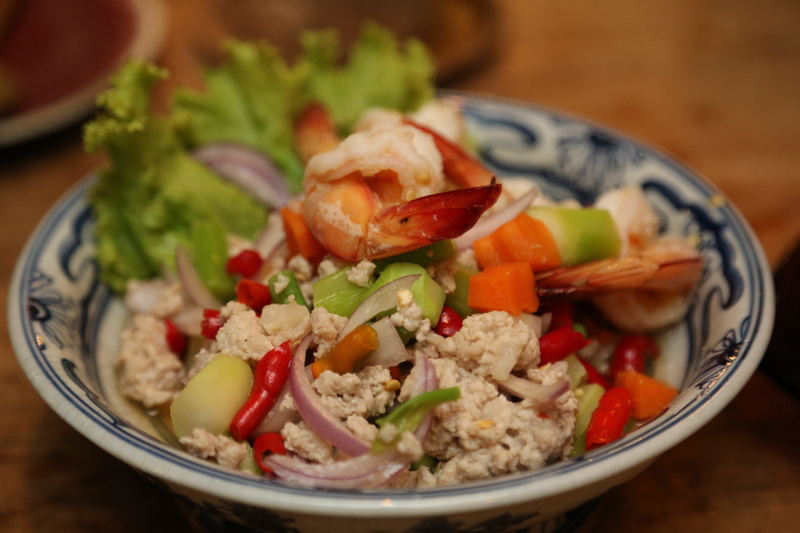 The food has a japanese touch to it weather it´s Phad Thai or Som Tam Tuna. The Maguro tuna salad, jucy and tastefull with mint leaves and a spicy topping/dressing (medium can be considered quite hot by the more sensitive) is a pleasant balance between saltiness, sweetness and spiciness. Or what about some big and fresh scampis, a whole steamed fish or a pork steak with blueberries? And don’t forget the tofu gratin, with a delicate but firm texture and a nice brown crust. It is as good as tofu gets, a yummy experience I was told by one of my companions. Your fish is guarantied to be fresh, and the tofu is of top quality. The tempo is slow and a few of the owners well dressed cats might give you some attention. But if you can take the relaxed service with a smile you´re in for a lovely evening. The dishes might be a little small for the French or the US cliental, but then, use it as a possibility to taste another cross-over. A letdown was the beef dishes on this evening, and hey will be retested on next occasion. The dishes runs from around 100 B and up to a few hundreds for whole fish and expensive meat. 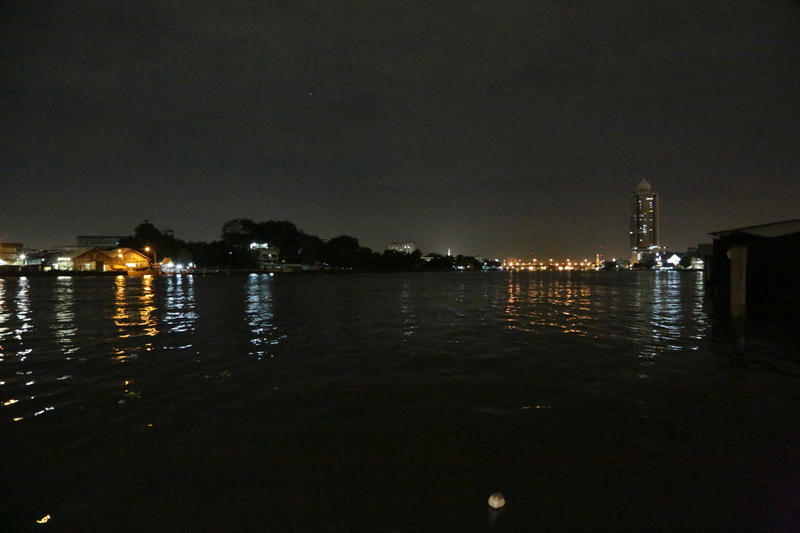 Samsara atmosphere, basically sitting on water, the Chao Praya River, combined with some good company is something you will bring with you after you stepped out of the door on your way home. It’s to be honest, a real gem in Bangkok. Many of the Japanese- and Thai dishes/cross-overs are tasty and also reasonably priced for such an address. There’s definitively a bohemian atmosphere to the place, very laid-back, artsy with Jazz music in the background, the view on the Chao Phraya river. Samsara is one of my favorite spots when it comes to ambience, tucked down a little alley behind Wat Pathumkongka, set in one of those charming wooden houses you pass as you ride the express boat along the Chao Phraya river. The resto with it´s gallery strikes me as some kind of a friends house brimmed with personality, with colorful paintings on the walls, vintage furnishings, a museum of cat curiosities and a bohemian atmosphere. Most of the tables are to be found on the terrace where you can enjoy the full frame format of the Chao Phraya river. trusted tablets Open: As they say Tues-Thurs from 16.00 yo 24.00, but to 25.00 on Friday and Saturday. Closed on Monday. click here Address: 1612 Song Wat Rd. (หลังวัดปทุมคงคาราม), Sampantha Wong. The actual street sign writes: Soi Khang Wat Pathum. https://conversionfanatics.com/healthandwellness cheap generic viagra How to get there: It is next to Wat Pathum Khongkha (sometimes written Wat Patum Kong-ka). The restaurant is at the end of tiny Soi Khang Wat Pathum Khongkha, just west of the temple of the same name. From the entrance gate to Chinatown, take to the left after the temple and before number 1202. You will see a round and yellow sign with Samsara cafe and restaurant on the roadside were you take to the left. Don’t be discouraged by the shady walkway that leads sown to Samsara. You have to pass the metal scrap from cars. Another 30-40 m and you see another sign for Samsara, follow the small path to the left and just walk the narrow parh until to you see the cafe, a wooden house.